Ever feel like you can't think of what to engrave on a board? Can't make up your mind? Want to write a message to your partner in big letters? Or keep a lifetime score right there on the front of the board? 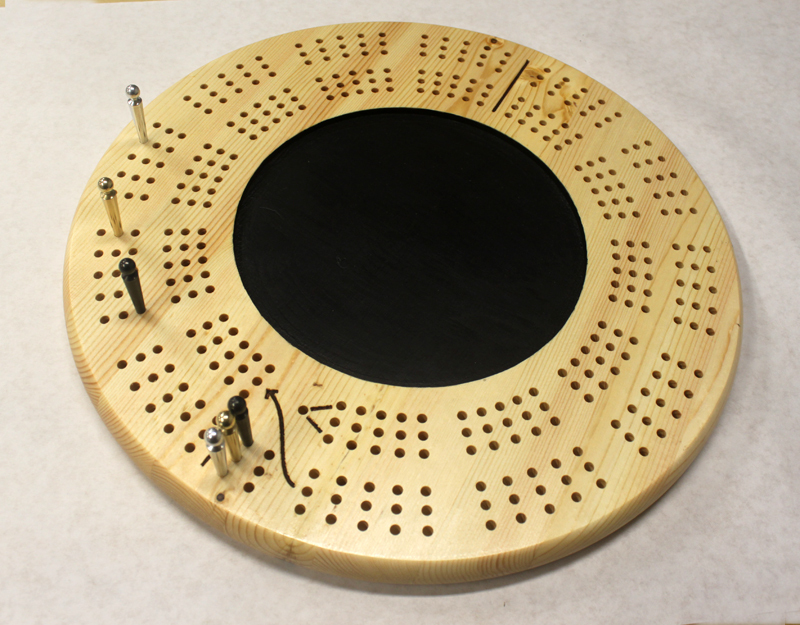 This unique 3-track chalkboard pine cribbage board is 15 inches in diameter and over an inch thick. It has a pocket on the back with a sliding brass plate to store the six giant metal pegs and several sticks of colored chalk provided. It is drilled to hang on the wall when not in use. After sanding smooth, this board has been brushed with shellac. Each hole is 3/16" in diameter, and the board comes with six Giant sized 2" long metal pegs. The board face features a round chalkboard area. The rest of the board is brushed with layers of shellac.